In addition to diagnostic codes for Grove and Manitowoc branded cranes that run on Manitowoc’s Crane Control System (CCS) and GMK cranes with ECOS systems, the app provides diagnostic codes for several National Crane NBT models, and for select Rated Capacity Limiter Systems on certain Grove and National Crane models. Manitowoc has released two apps that help crane owners on the job site. The first is the "Manitowoc Diagnostic Code App" that helps users diagnose technical issues with their cranes. In the past, when cranes had technical issues, Manitowoc customers had no way to interpret the diagnostic codes that would appear on the main display of the crane's cab. Specialized technicians would have to be called to the job site with proprietary equipment, and any time spent waiting affected the project schedule. 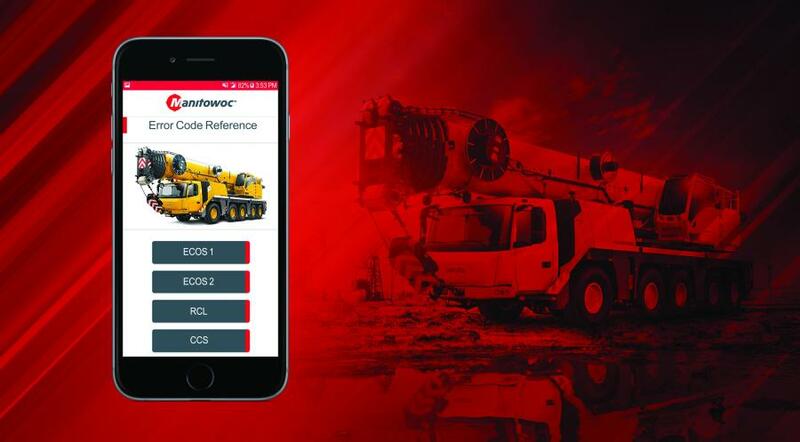 Now, with this freely available smartphone app that instantly tells users what codes mean, crane owners can begin working on solutions immediately, boosting their uptime. In addition to diagnostic codes for Grove and Manitowoc branded cranes that run on Manitowoc's Crane Control System (CCS) and GMK cranes with ECOS systems, the app provides diagnostic codes for several National Crane NBT models, and for select Rated Capacity Limiter Systems on certain Grove and National Crane models. The second app is a free "Manitowoc Boom Length Selector App" that helps crane operators and owners to quickly and easily determine the overall boom and jib length combination required for a lift. The Manitowoc Boom Length Selector App allows users to select specific boom and jib length combinations, building heights, boom radii and other crane parameters using an easy sliding scale to determine the basic crane setup for a specific lift. Both apps are available in the Apple App Store and Google Play Store (iOS and Android). Additionally, Manitowoc has been increasing its telematics capabilities for Potain users. With the Crane Star Diag service, tower crane customers can now access vital crane data from laptops or smartphones. This includes information relating to utilization, productivity, and fleet/crane uptime. Furthermore, crane technicians can access and upload maintenance data on cranes, and service managers can conduct real-time remote diagnostics to optimize technicians' work times and crane uptimes. Grove's new CCS simulator features the same CCS operating controls and displays used on newer crane models. In particular, it features a 40 t rough-terrain crane equipped with 102 ft. (31 m) power boom and offsettable swingaway. Six interactive job site scenarios displayed on multiple screens and a CCO practical exam course teach the operator fundamental load control skills, enabling them to gain proficiency in using CCS in a safe and controlled environment. Grove also featured a simulator that is used for all-terrain crane training by the company's GMK Training Department. This simulator also is equipped with CCS functionality, and users of the simulator operate a virtual GMK5250, while technicians can also practice diagnostics on the virtual crane. The simulator was on hand at bauma to highlight Manitowoc's training progression program — which trains people from novice to master technician — and also includes testing and certification for master technicians.